Having a resource for accurate ready-built CAD models certainly saves time. From hardware fasteners to specific product designs, more and more suppliers are providing 3D models of their products either directly from their sites, or through community contribution sites that host supplier-certified models. So it should be no surprise that the National Aeronautics and Space Administration (NASA) is doing the same by providing 3D CAD models of the many technological marvels that have traveled the sky and beyond. 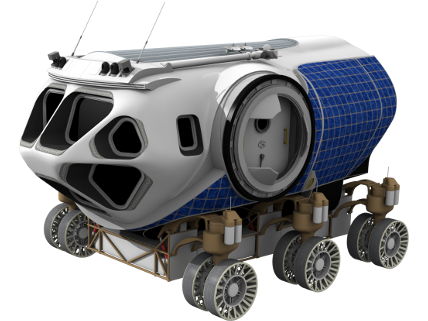 Currently the NASA 3D Resources site is hosting over 300 models that range from A (AcrimSAT) to Z (Z2 Spacesuit), and include the full array of manned, unmanned and satellite programs. Files are primarily available in obj format, and they are in the process of converting models to stl format for 3D printing. Therefore, whether your interest is driven by design, curiosity or nostalgia, NASA 3D models are certainly an intriguing resource to living history. Google Sites... "an effortless way to create beautiful sites"
For any startup CAD entrepreneur / contractor / freelancer looking to quickly and easily create a web presence without the overhead of a paid domain, using Google Sites has been a great zero cost solution. Since being redesigned in 2016, the new Google Sites provides a clean, crisp updated look supported with simple, easy to use tools. In addition, having a web site that works and looks great across mobile and desktop devices is essential today, and Google Sites does it perfectly! As anticipated, the option to migrate classic sites to the new sites became available this year. After migrating, you have the choice to keep the same URL, or to create a new address. Also, as forewarned in the migrate process, not everything from old sites migrates perfectly to the new. So after migrating and some playing around, you might just find it more convenient to simply recreate your pages, and thus give everything a fresh new look. Granted, there are some inherent limitations to the ready-made editing tools, but it's a fair trade-off considering everything provided is free. Also included is the option to add embedded code which certainly helps give more latitude to how you develop and design your site. As an ardent proponent of Solidworks Workgroup PDM, it was disappointing to come to terms with its end of life. Originally developed by Design Source Technologies, Inc with president and co-founder Jim Foster, the PDM tool was entitled PDMWorks. It was out-of-the-box basic and simple all around, much to the delight of administrators and users alike. Solidworks recognized its value and acquired it, renaming it as Workgroup PDM where it continued to be appreciated as a reliable file management tool. Based on a flat windows folder database structure, it has understandably been showing its age and being included with Solidworks Premium and Professional licenses was not a revenue generator in and of itself. Now with its demise, the alternatives parlayed by Dassault Systemes are Solidworks PDM Standard and Solidworks PDM Professional. The later formerly known as EPDM or Enterprise PDM, was acquired from Conisio @ 2006. Based on Microsoft SQL database structure, Dassault Systemes has put forth great effort to promote it as a "data management solution for organizations large and small", with scripted information that makes for a good first impression. Like most marketing and sales related impressions though, it's what is not being said or shown that needs to be asked. For PDM administrators, the dilemma is that you simply might not have a good working knowledge of a product until you've... well, worked with it. 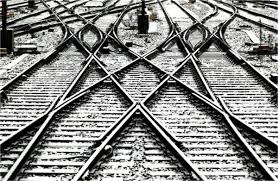 As such, it isn't always apparent what questions to ask until you turn a corner in your understanding and suddenly realize you don't know anything about what's next, or how one aspect relates to or controls another. For Solidworks PDM Professional, from the online presentations to the VAR sponsored demos, there is a clean polished display of what it can do, and it looks and sounds great. It's from the point of commitment however that things become... well, it's complicated. From the perspective of transitioning from Solidworks Workgroup PDM to Solidworks PDM Professional, here are some things that if not already apparent, certainly need to be discussed with a VAR when you hear them. This is especially so if you are anticipating a contracted statement of work (SOW) prior to implementation. "easily migrate CAD data" This expression sounds like everything will be taken care of for migrating your data. If agreed upon, only the most recent CAD files will be migrated to the new vault in the same folder structure arrangement. However, they will be in a "legacy state" that will most likely require you to manually transition each file to a working workflow if you want them in a working state. Also, none of the PDF copies of drawings contained in the Workgroup PDM vault will be brought over unless you specifically request such, because after all, they're not CAD data. Yes, if only you knew what to ask. "have it all set up" This expression sounds like everything will be taken care of and you will simply need to show up and turn the key. From the initial consultation of current workflow processes, to the Administrating Solidworks PDM Professional Training you will begin to grow in your awareness that most everything required to make your PDM system operational will need to be learned, setup and tailored to fit your needs. Some points of application might be easier to understand, others will be totally new concepts that will take time to understand, implement, and test. Once understood, additional questions will inevitably arise. The VAR training includes examples on many points in the manual, but there really isn't enough time to cover every aspect in detail, nor the subsequent questions that naturally arise. The VAR will initially take the lead in developing each of the needed elements for your PDM system, and provide assistance along the way, but the operative word here is "assistance". Likely, you will receive assistance as you request it during the subsequent weeks that follow deployment. However the Admin is more or less left to discover what works and what doesn't, followed by head scratching, on-line research, requesting assistance or direction from your VAR, development and testing. Yes, if only you knew what to ask. "have any questions" This expression too sounds like everything will be taken care of if you should ever have a question. As already discussed, you WILL have questions that arise only after you have made advances in your working knowledge of the software. Depending on how you arrange your workflow and transitions, some aspects of PDM Professional can be automated within PDM, others will require knowledge of API or dispatch programming. This will apply if you want to simply update a drawing when changing states such as from preproduction to production, or to simply update a drawing Revision Table with revision information. For example, would you know to ask if the Solidworks Revision Table works for Solidworks PDM? It's not a stupid question. It really doesn't work. So you will need to use a General Table edited specifically to function as a revision table. (Update: with the 2018 release, PDM now integrates with the Solidworks Revision table.) As these types of boggling issues surface, the VAR may or may not provide the hand-holding assistance you would like to have to address your questions as you navigate to the next corner and emerging question. In fact, you most likely won't be aware of initial shortcomings in your preset workflow and transitions until you realize you don't have the functionality you expected. All of this leaves the Admin in the unenviable position of having to make these edits to tailored PDM functions as projects of themselves, while communicating to the engineering team why Workgroup PDM used to perform all of these functions but 'we can't right now with PDM Professional until we do more programming'. Programming, which in all likelihood will again require some form of research, requesting assistance or direction from your VAR, development and testing. Yes, if only you knew what to ask. Those who have successfully navigated the implementation of Solidworks PDM Professional are to be commended. They have garnered a worthy skill set using a product that possesses a puzzling array of potential. To put it judiciously... it's complicated. It's certainly not what everyone wants but seems to be the only choice Dassault Systemes wants to offer. With years of use behind it, isn't it strange that Solidworks PDM Professional would be so unduly complicated, yet in many ways does less out-of-the-box than Solidworks Workgroup PDM? In summary, Solidworks PDM Professional is anything but turn-key. It's an auto mechanic dropping in a new engine for you, tightening it to the frame, showing you how a hose or a cable connect, and saying "you can deploy in as little as ten days... to capitalize on new opportunities faster"! Sure, out of necessity you will figure it out... eventually,... but it's complicated. You asked for an expensive new engine and naively thought you could just show up and turn the key, because you didn't ask the right questions. With the recent announcement of SOLIDWORKS Xdesign, the world of browser-based and mobile mechanical design CAD has a new and exciting entrant. As is common among the trappings of annual user events, Xdesign premiered as a working demo, while anticipating a private beta in May, followed by a public beta yet in 2016. The Xdesign site reflects similar depth by presently only providing sign up for updates and beta consideration, and an informational YouTube video that while polished and well produced, clearly is intended to be more inspirational than informational. As part of the larger Solidworks Innovation Platform (think 'all things Solidworks') and following recent releases of cloud-based Conceptual Designer and Industrial Designer, Xdesign is touted as a cloud-based, fully fledged CAD system, capable of 3D parametric modeling. As its own entity, Xdesign will run a different modeling kernel than Solidworks Desktop, and will store its data entirely in a cloud database. With this foray, attention within Solidworks will be divided to support both Desktop and Xdesign, and their corresponding development. Perhaps of equal interest from this recent announcement at Solidworks World 2016 is the data storage functionality that will be known as Xdrive. Likened to a Dropbox for Solidworks, the Xdrive app will serve as the data bridge between Solidworks Xdesign and Solidworks Desktop, and is slated to be included in the Standard subscription release of SOLIDWORKS 2017. As another aspect to the burgeoning Dassault Systemes 3D EXPERIENCE platform, the impetus given to Solidworks Xdesign will no doubt correlate with their concerns of current and future market share. With a well recognized and loyal customer base eager for staying technologically relevant, establishing Solidworks Xdesign as a credible CAD system is imperative for industry giant Dassault Systemes. This is especially so given Solidworks latent posture among established browser-based and mobile mechanical design CAD pioneers Autodesk Fusion 360 and Onshape. There is more information available today than ever before. Aside from sponsored content, how can any one person sift the entire internet to discern what is valuable from what is trivial? The answer simply is you can't,... but an algorithm can. YouTube's auto-generated channels are created by algorithms to collect trending and popular videos by topic. Auto-generated channels act like user channels in that you can subscribe to them and stay updated on new videos. 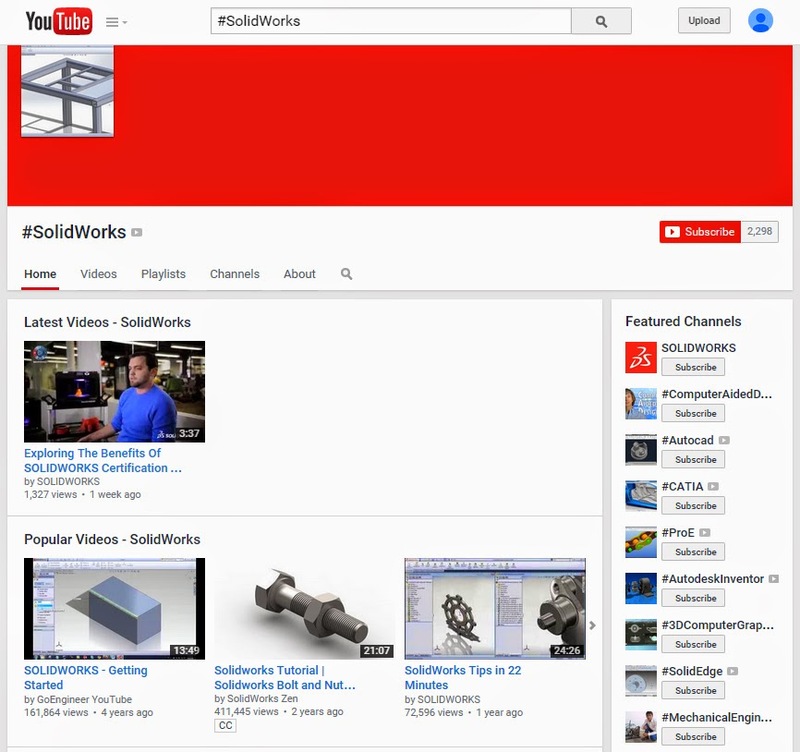 YouTube's auto-generated channels begin with a # symbol (i.e: #SolidWorks, #CATIA, #Autodesk, #ProE, etc.) and contain a notice in the About section that they are auto-generated. The clear advantage of auto-generated channels for video information is the enlarged content, filtered for usability. Yes, of course all of the big players have their own channel, but the information in a sponsored channel is selective and controlled by the sponsor. In other words, it is limited by what they want you to see. However, an auto-generated channel will include all video content relevant to the topic. Thus, auto-generated channels provide you with the best of everything related to the topic, regardless of who created the video. For CAD users, scripted instructions of Help sections, and company-sponsored sites all have their place in the scheme of things. Video instruction though is such a powerful tool as it provides clear, visual step-by-step instruction. So it's nice to know a collective / sorted resource of video information is available with seemingly little effort. So if you're interested in viewing features of a CAD program, training, tips, or whatever is relevant to the topic, then the auto-generated hashtag # channel is an excellent resource to view the most relevant information quickly. As an additional benefit, the side bar of any channel includes Featured Channels that might be of a related interest to the viewer as well. Thereby easily expanding your pool of available resources, as needed. And you don't have to limit yourself to CAD, as YouTube is auto-generating an ever increasing number of channels in any topic, including music / musicians with selected entire album content of which you can subscribe. Yes, what more could you ask for from an algorithm! Onshape Incorporated has just opened its doors, albeit slightly with a fresh and updated website providing a glimpse into this new company and the excitement they are bringing to the CAD community. With a welcoming and transparent view of the team and credentials, the company includes a robust mix of industry veterans in the fields of engineering, marketing, sales & support, user experience & product definition, along with a variety of interns getting in on the ground floor of something substantial. Among the early surprises is the offering to be considered for an early access pre-production version of Onshape. The criteria to be considered includes a willingness to share details of your real design project, keep all information about Onshape confidential, and that you don't work directly or indirectly for a CAD vendor or reseller. If interested, you may want to hurry since the offering will be limited to a select number of design teams. For what you might be giving up in this pre-production arrangement, you gain by receiving free early product access, technical support, the opportunity to steer the development of Onshape, and recognition / credits towards the production release. No doubt the CAD community at large is eager to see and hear more about this new product, as the original pioneers of SolidWorks develop Onshape further, for as they say... "the world has changed." Many have experienced the frustrating constraint with having to design using a single monitor, whether with a desktop or laptop computer. If having to do so, then you are sure to benefit from the Design Library of the Task Manager. 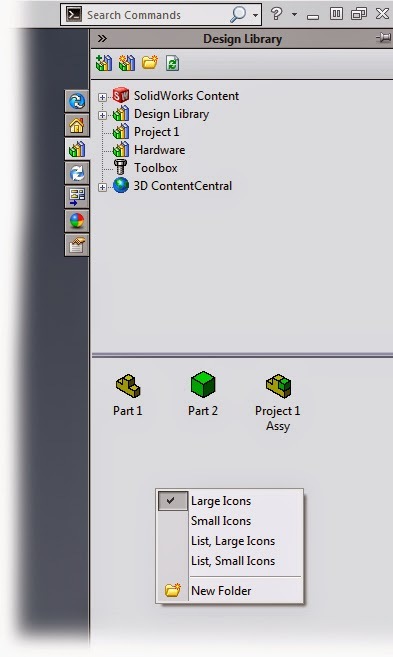 Being both simple to setup and simple to modify as needed, the Design Library allows easy access to the Windows folders of your choice, without ever having to leave SolidWorks. Additionally, the workflow to using the Design Library eliminates the repetitive menu clicks of browsing for and inserting existing models, blocks, or annotations. For example, suppose you have a folder of CAD models specific to a project, and another folder of common hardware CAD models. By adding these two folders to your Design Library, the folders are now readily available to select. When a Design Library folder is selected, the lower file view window provides icon imagery where the size can be adjusted to personal preference with a simple right-click menu selection. Although the Design Library only provides visibility / access to parts, assemblies, blocks and annotations, it does conveniently allow for drag and drop capability, saving time and effort in the design process. Learning a new method or workflow always takes a measure of confidence that the initial effort in setup will bring real benefit. Utilizing the Design Library is just another example of that. Easily overlooked, it is especially helpful if you only have a single monitor to use with designing. By simply taking less than a minute to arrange, the Design Library can yield tremendous gains in finding the models you need quickly and efficiently, without ever having to leave the SolidWorks environment. The only question you might have after setting up and experiencing the advantage of using the Design Library to access folders is... what will do you do with your added free time?! CAD Graphics BlogWorks is an independent forum produced by CAD Graphics, LLC and is neither directed nor compensated by any other entity. Add a logo to a SolidWorks drawing... the smart way! How to Start a CAD Business? © 2008 - present | CAD Graphics, LLC | All rights reserved.
. Awesome Inc. theme. Theme images by Airyelf. Powered by Blogger.